Juventus are reportedly setting their sights on Wolves midfielder Ruben Neves, while Daniele Rugani could leave with Roma eyeing a move. Neves, 21, has continued to impress this season in his first campaign in the Premier League after playing an influential role in helping Wolves secure promotion last year. The Portuguese international has two goals and an assist in 12 games so far this season as he continues to gain experience and develop his all-round game at the highest level. According to Tuttosport though, his agent, Jorge Mendes, met with Juventus sporting director Fabio Paratici on Wednesday and Neves was said to be discussed between the two parties. With Blaise Matuidi and Sami Khedira on the wrong side of 30, Juve arguably need to start considering the long-term future despite the fact that their current options look set to guide them to further success this season. Neves would certainly fit the bill as he still has his entire career ahead of him, and coupled with the quality that he has showcased to this point, it could be a great addition for the Italian giants. 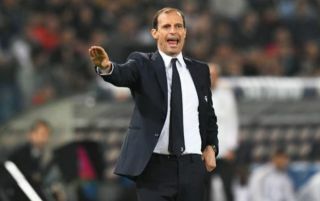 Meanwhile, coach Massimiliano Allegri could face a headache in defence, as Rugani is being linked with an exit as Roma sporting director Monchi reportedly had a meeting with his agent on Wednesday, as per Corriere dello Sport. It’s noted that Kostas Manolas could be heading for Turin if Juve opt to exercise his €36m release clause, and so if he were to arrive, that could finally force Rugani to secure a move elsewhere. The 24-year-old has been restricted to just three appearances so far this season, and so if additional competition for places was to arrive, that would surely make an exit the most sensible option for him to secure regular playing time and kick on in his own career having been left frustrated so far this season.